I need to make you aware of a couple of adjustments in our schedule. We were supposed to take the tent to the Ft. Worth area, set it up tonight and begin tent revival Tuesday night. The owner or manager of the property delayed the process for weeks by not providing some key information and that delayed Pastor Stevens from being able to make application to the city. There was still no permit by Friday evening and so Saturday I made the decision not to take the tent to Texas. We have a 2000++ mile loop to make and I do not want to drag the tent trailer along and find alternate parking for it at every church IF it is not necessary. Since we do not know, I left it in Mississippi. IF the permit comes through this week while we are enroute, then the church may rent a tent and begin revival Wednesday night. IF the permit does not come through, we will begin revival Wednesday night in the Victory Tabernacle Church in Watauga. There will not be church Tuesday night either way. I will let you know more when I know more. Also our revival at Gainesville, Texas October 8-10 has been postponed. I will post a replacement date soon. Our exciting weekend kicked off Friday with another great meal in Sis. Kim's kitchen and a grand finale Friday night under the Blue and White Gospel Tent. The last service was excellent. The man in the picture below makes tent revival worth every ounce of effort, every mile driven and every dollar spent! His name is Jake. Jake was across the street from the park at a store and heard the preaching Friday night. He came over to the tent in his car, but could not get up the nerve to come under the tent. He left and started home and had to turn around and come back. He said the Lord was drawing him. He and a friend came under the tent for about the last 10 minutes of my preaching. When I made the altar, He got up and came to the altar. He left the tent saved and on his way to Heaven! Hallelujah!!! He told me later that he could hear every word of the preaching clearly! Praise God for the astounding gift of good sound equipment! Friends, that thrills me to no end! The tent was too wet to take down Friday night after church, but every one jumped in and helped us put up the chairs in the trailer and load the sound equipment back into the bus. I was up early anticipating a little sunshine so that the tent would dry and we would be able to get it down and packed away before the rain was forecast to fall again. I moved the trailer onto the parking lot and for a while the promise of sunshine seemed like a fairy tale. While I was taking down lights and trying to dry the grass under the tent with fans, the sun began to shine! Hallelujah! Bro. Scott and his family and church came and the tent came down and was packed away in short order! I will have pictures of all of that later. Once we were ready to ride, I fueled up in Richton and we met Bro. Scott and his family at Front Porch in Hattiesburg. Good, good, good! The services were great Sunday. We are usually only in Ellisville in February so it was terrific to be with them on a Sunday in between our normal visits. 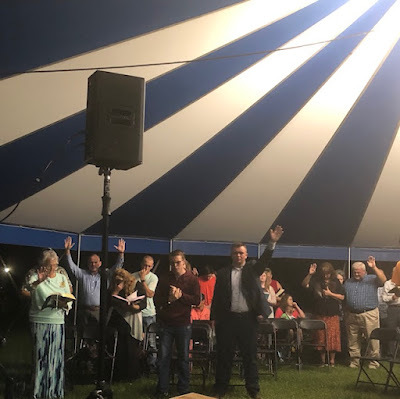 We were blessed to see several Ellisville folks at tent revival in Richton last week, but it was wonderful to get to see them all this weekend. Pastor Kenny and Sis. Joan Morris and First Assembly have been such great friends to our family. We have had some wonderful revival services here the last 12-13 years and we love being here with our friends. I sure hope they do not get tired of us any time soon. Odie snapped some great pictures. Of course the first one she sent in is a picture of Mr Anonymous himself. That wraps up our weekend. Today we will begin making our way to Texas. We are excited to see what is around the next corner. Thank you for coming along with us for the ride. I hope you enjoy it. Davy & Family, a bunch of really real nice photos, TXS! for sharing. Y'all have a Blessed-DAY Everyday !~!, the Shifletts.. Thank you, Bro. Frankie. We get to rub elbows with a bunch of great folks all across this country!